Ok I did the math and it looks good on paper, but the more I read the more I second guess. I would like to hear some thoughts about the following (especially from those with the 2.5L 2nd gen). I have a 2019 2.5L 4 cyl. - Ext cab - 6' bed - G80 diff - 7way is wired up with a class 3 hitch - max 3500 tow capacity. 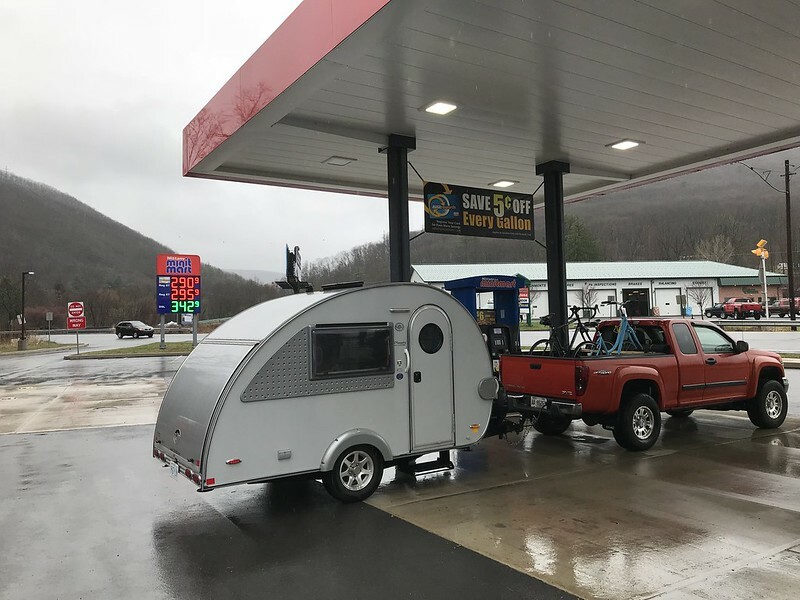 I am planning to tow a teardrop that will have a trailer weight around 2200 to 2400 lbs (2500 lbs worst case - 29% less than factory stated max tow capacity) that has electric brakes and will have a tongue around 250-300 lbs. 98% of the time it is a daily driver and not towing. Planning to take 3-5 trips per year with maybe 1 trip per year going in the mountains like the rockies. Max speed would 65mph. My payload is 1422 and after subtracting: cargo, tongue weight, my wife and I we still have around 400+ of payload left. And I figure our adjusted max tow capacity after using GM trailer guide drops us to around 3090lbs. (which is 19% less than factory stated max. tow capacity). We are definitely under our GVWR by 450-500 lbs and under our GCVWR by 1350 lbs. Thoughts? Again any 2.5L gassers have any experience to share? Well you have carefully done all your homework. As long as you have proper weight distribution so your tongue weight is at 10-15% of trailer weight it should handle the load no problem. Have fun , take your time down the hills, you will be fine. 16WhiteColly, Hunter62, BTombaugh and 1 others like this. I think you'll be fine. We had a teardrop before we bought our latest camper (Which is why I bought the truck in the first place). As long as you stay under the towing limit, you will be OK. That sounds like a big teardrop! Ours was around 1100 lbs. loaded. I pulled it with a MINI Cooper. 100MPG, 16WhiteColly and splatmatt like this. 2016 Colorado WT Crew Cab. Black, Appearance Package, Towing Package. ZROADZ Front LED Mount with Lumen 3 inch pods. I think you will do fine. To compare . . . my dad towed the 16' Airstream Bambi trailer with the 1960 Chevrolet Biscayne inline 6 and 3 speed manual transmission up to Estes Park and beyond. Going up some of the passes was a lot of 2nd gear all the way. And good thing for the electric brakes he had going back down. You have about 80 more HP in your 2.5L modern engine but maybe 30 lb/ft less torque. Just keep the RPMs up going up grades and use the manual shift position. You should be fine given the numbers you provided. The advantage you have with a teardrop trailer is the small frontal footprint it has to wind resistance. This plays a major role aside from weight when towing at highway speeds. 4x4x4doors, 16WhiteColly and splatmatt like this. That sounds like a big teardrop! Ours was around 1100 lbs. loaded. I pulled it with a MINI Cooper. nucamprv.com [email protected] 320 S unloaded weight with a full propane & battery is 1900 lbs with around 190lb tongue. It can handle up to 2900 lbs. And 80% percent of the 2nd Gen 2.5L max tow is 2800lbs - so it seemed like a good match and will won’t be more the 2400lbs (with water tank full - usually we are around 2250lbs. - 2500lbs worse case, but if I bring that much crap it isn’t camping - lol). I towed my [email protected] teardrop with my 2008 Canyon for ~15,000 km. My truck had a 242 hp 3.7L 5cyl engine, and a 4 speed automatic. So, a little more power than the 2.5L, but fewer gears. When people asked me how the truck towed, I always said it was a very good match for the trailer. It always felt stable, (unless I loaded too much weight behind the trailer's axle). A Tekonsha Primus IQ handled braking duties very well. The engine provided good acceleration for merging onto highways, though sometimes I put my foot to the floor, if there was dense traffic. Climbing hills was good, though the engine did have to rev. Through the hills of PA, to maintain speed, I sometimes had to keep the revs at about 4000 RPM for some climbs, so it was loud, and the engine was working hard, but it did what I needed it to. Going down to a 200 hp 2.5L 4 cyl, you are certainly going to have to keep the revs high when climbing, so be prepared for that, and understand, that on steep climbs, your speed might drop a bit, especially if at altitude. But, the load is well within your truck's ratings, so its not a safety concern. Just set your expectations accordingly, take your time, and enjoy the ride. JBT, impact, 16WhiteColly and 1 others like this. I want to thank everyone for their input... I thought I was ok based on the numbers and staying well below rating maximums. It is helpful to get input from others too. First tow is going to be light (following the trailer break-in procedure which is after the initial engine break-in there is another one regardless of miles for towing. • Do not tow a trailer during the first 800 km (500 mi) of vehicle use to prevent damage to the engine, axle, or other parts. • It is recommended to perform the first oil change before heavy towing. • During the first 800 km (500 mi) of trailer towing, do not drive over 80 km/h (50 mph) and do not make starts at full throttle. So I will take the trailer on some straight country back roads and get the 500 miles of trailer towing @ 50 and less. I plan on keeping the truck for 10 years (longer if possible). Last edited by splatmatt; 04-16-2019 at 11:39 AM. Good info - that looks nice - thanks for sharing! Just checking to make sure I am not misreading something here. The trailer has electric brakes and the truck has a 7 pin connector which comes with the GM tow package. I did not see where a brake controller in the truck was mentioned. My understanding is a brake controller is needed to provide electrical through the seven pin connector. Please correct me if I am wrong. I have been to Estes Park and across Trail Ridge Road a number of times. It is my favorite place on earth. You will be revving your engine pretty good. I suggest breaking it in first like you plan to and changing the oil over to a full synthetic of your choice before the trip. Which transmission do you have? Manual or Auto? It's a truck that is fundamentally capable of towing 7700lbs. Any lesser ratings are almost purely a function of cooling capacity (while towing at max rating, up a long steep hill, in death valley). Of course you are going to be fine. Just keep an eye on temps like you should anyway. Level is meant to be earned, not installed. I have an Prodigy RF brake controller. The 7 way is proper and has a constant hot - GM wires all Colorados ready to go (some just need the receptacle, but relays and proper gauge wire was already in place stock) - Auto 6L50. Already did 500 mi initial break-in (kept under 55 mile per hour with no long constant speeds - backroads) and changed oil. I’m at 3k miles now. I will also follow the recommended trailer towing break-in per manual. Also oil by default is full syn as it is 0w-20. splat att, do you have a brake controller as mentioned above? If not, you really ought to install one. For safety! Just keep an eye on temps like you should anyway. Good point - nice thing about these trucks is that even the small engine versions include the info center with a transmission temp gauge. Plus I drive slow - as the [email protected] teardrop tires are rated for 65 mph or less and I’m no rush. splatmatt, do you have a brake controller as mentioned above? If not, you really ought to install one. For safety! Yep, it’s a Prodigy RF proportional brake controller. That will work fine. Watch some YouTube videos and they will help you get it set up right. Takes a little tweaking to get the settings right. I’ve used before on my previous vehicle. It is just as good as the tekonsha p3 just suppose to be easier to move from one vehicle to the next provided a 7way exists. Last edited by 16WhiteColly; 04-16-2019 at 06:33 PM.